The pressure drop in the venturi is proportional to air density and the fuel is at ambient pressure in the float chamber, so I would expect the fuel flow to reduce proportionally with density, and that response to preserve the fuel-air ratio over changing altitude. But in practice that does not seem to be the case. Proper response to altitude requires additional modification that most carburetors don't have, so the pilot usually has to lean out the engine as they climb. What am I missing here? This still leaves open the dependence of fuel flow on $p_d$. If the relation is reasonably close to linear, it should mean the venturi mixes properly by mass. I can see a reason why higher pressure should cause less than linear increase in fuel flow, but not much why it should cause more than linear increase in fuel flow—but that is what the actual behaviour would need. Note: Did you notice the extra $v$ conspicuously missing from the last equation? That suggests the mixture should become richer with throttle opening—which is actually the reason there are extra fuel jets after the throttle that pull in extra fuel when the throttle is at idle and slightly above. It might also explan what is going on here, but would require explaining why the speed should increase when the density is lower. The simple reason is that high altitude changes the density of air, but not the density of fuel. Most simple carburetors use a simple venturi design that mixes air and fuel by VOLUME. But, the correct air/fuel mixture must be based on MASS, not Volume. If the air/fuel Volume is correct at sea level, it will be too rich at altitude. This is because a given volume of air will have less Mass at high altitude, while a given volume of fuel will have the same Mass at high altitude. Aircraft carburetors have a mixture control to "lean" the volume of fuel to the volume of air, and are then able to maintain the correct air/fuel ratio at all altitudes. Leaning is not done to counter carburetors that do not "preserve the fuel-air ratio over changing altitude". 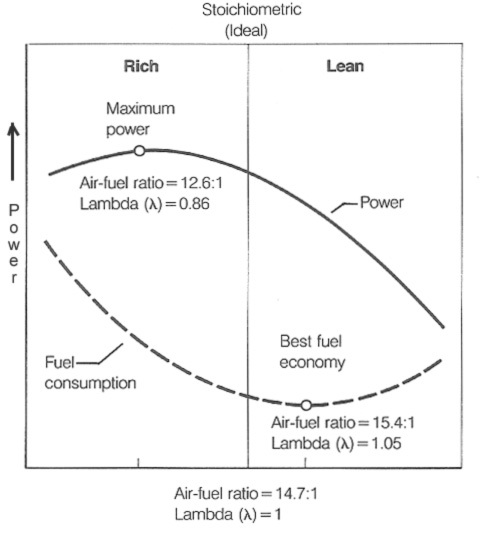 The [operationally] ideal stoichiometry (air:fuel ratio) is not fixed, it depends on what is being sought. Leaning is done because it provides better fuel consumption when less than full power is needed (see graph below), which coincides with cruise. Rich mixtures also burn cooler, so leaning becomes practicable and easier on the engine in the colder air of the cruise altitudes. It's not pressure that forces fuel into the venturi as much as the vacuum pressure sucking it out. Fuel is pumped or gravity fed to the carb, but then it's metered into the bowl by the float. Fuel sits in the bowl before getting pulled into the jets and then into the venturi. There is air in the bowl, sure, and as that air pressure decreases with altitude there is a bit of a decrease in the pressure behind the fuel, however the part you may be missing is that air can mix with a much higher ratio of fuel than what is ideal for an engine. Airplane engine carbs are generally tuned so at sea level they deliver slightly over the ideal ratio, this is done by restricting the fuel flow. If it wasn't restricted the engine would run rich on the ground. As density altitude increases the amount of air going through the venturi decreases, but the air still can hold more fuel so the mixture richens even though there's less pressure. First the float chamber. Fuel flow into the float chamber and out into the carburetor venturi functions exactly like a toilet bowl irrespective of whether the fuel is pumped or gravity fed. As fuel level drops the float opens a valve to allow more fuel into the chamber. The explanation of fuel/air mixture relative to altitude is explained in "Flight Mechanic" as follows: fuel draw into the venturi is dependent on airstream velocity. There for, as air density decreases with altitude, the fuel air mixture reaching the cylinder through the intake manifold will be richer. This is why fuel mixture is "leaned" with altitude. Post Script: ymb1 may be closest here. It may be we do not lean for high altitude, we richen for lower altitude. This is because more power (Fuel burn) is required for take-off or go-around. Full Rich is selected to avoid overheating the engine. At cruise power demands are less, therefor more economical lean can be selected. Although gas is wasted at full rich, it does serve a critical function of keeping engine cooler at max power output. There for, the carburetor fuel aspirator oriface is designed to give a rich fuel mixture, that can be leaned (pinched) by the pilot with the fuel mixture control. Addendum to Post Script: The crux seems to be "at constant (cylinder) volume, RPM, throttle, and rich control settings, does fuel/air mixture change with altitude (ambient pressure). This could be easily tested in a room where "altitude" can be adjusted (CO meters please). Lower ambient pressure should result in lower fuel intake, as Jan Hudec suggests, due to lower pressure differential, but other factors may be at work here. Rate of fuel evaporation will increase at lower pressures significantly, which may account for richening of mixture. Also, positioning of fuel oriface in the carburetor (why not after the venturi where vacuum is greater?) could be tested as well. Why do we lean the mixture when the air become less dense? Why do some aircraft have wings that tend to bend up? Can leaning provide more power when running at full throttle? Why does enriching mixture over stoechimetry give more power ?